The Avengers headquarters features a 2-level office building with a meeting room—including a table with a secret gun compartment, an opening ‘laser-beam’ safe, helipad, garage, rooftop spring-loaded shooter and dual stud shooters, plus a rotating, tilting radar. This popular toy also includes a buildable toy helicopter with adjustable, spinning rotors and 6-stud rapid shooter, and an offroader with a rotating turret with dual stud shooter. 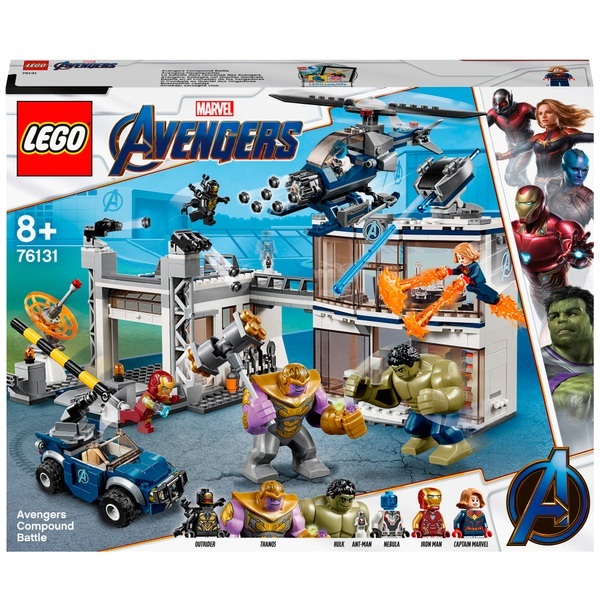 Play out thrilling scenes from the Marvel Avengers movies with 4 minifigures, an Ant-Man microfigure and posable Hulk and Thanos big figures.